This cutie is dressed in mauve silk with blue silk ribbon trim. Beautiful lace is at her cufs and the bottom of her dress. 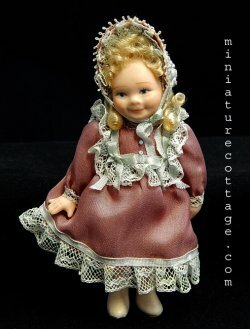 She has a sweet expression on her face and is well painted and wigged. Her bonnet and shoes are very well done. She is signed Lyane Brown 93 onb bottom of her shoe.